So first of all it should never have been called “Morning Sickness” and that goes for double for me. I feel worse in the middle of the day and right up until bed time. When it’s bad some days it even wakes me up in the night, although the increase in bodily fluids such as mucus really hasn’t helped! They don’t tell you any of this though. I know that some people have morning sickness so badly that they get dehydrated and end up in hospital. Luckily for me I haven’t been that bad, but it’s taken it’s toll either way, I have never felt so exhausted and unwell. 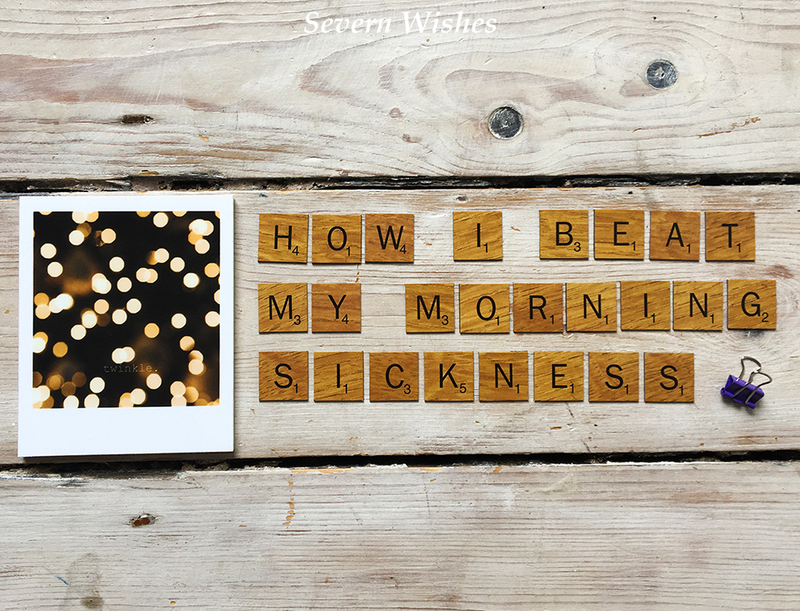 So I wanted to write this post and put out some ideas and tips on how I’m currently beating my awful sickly feelings. The first few weeks were definitely the hardest. I couldn’t go anywhere outside of my house without a cold bottle of water, a packet of Sugar Free Polo Mints and a box of salted biscuits in my handbag. I have to say though, the sickness was worse for me the more hungry I got, so I tried to not get hungry by snacking little and regularly. Grapes were a great idea, seedless and cold right out of the fridge, followed by Salted Biscuits or Crackers. My Top Tip is Water! Water always helps if you sip it slowly and especially if it’s cool, the mints and peppermint flavour in general can also help with the feeling of being nauseous, and the salted biscuits were what I snacked on between meals. I found that if I got even remotely hungry I would feel terribly sickened. So by not letting myself get very hungry, and eating smaller meals more often plus the snacks I slowly began to beat the sickness. The trick is to breathe and tell yourself you aren’t going to be ill, take a sip of water and eat something like a mouse, nibble and take your time. After week eight I even purchased some “Sea Bands”, they are sickness bands that work by using the pressure points on your wrists. I know that they don’t work for everyone, but when my sickness was so bad that I couldn’t even lie down flat to sleep, I found that they did help me. I had the feelings by this point in pregnancy but wasn’t actually sick. I would press on the pressure point while sipping cold water and breathing slowly but deeply. Like I say it works for me, and even when I am having the odd sickly day now, I wear the bands. I also wear them in the car because I find motion has often contributed to the feelings more so than before I was pregnant. Don’t forget that if you’re struggling to eat a lot now in these first few weeks, that you can make up for it when you’re feeling a lot better. You will need to take a supplement that your midwife should recommend you anyway. But after you begin to feel more like eating you should establish a healthy routine of snacks, such as fruit and vegetables to make up for any unhealthy snacks you eat when feeling bad. Trust me when I say that some days all I want and do eat is a bag of crisps or a bar of chocolate, but I also eat grapes and other easy to eat fruits that can be carried with me or taken to work in portions. Reach for the good stuff if you can, and don’t forget that a glass of juice or smoothie will count as one of your five a day too, and that is easy! I’m now approaching the half way point in my pregnancy, and I cannot believe how quickly it’s going. I still have days that I’m feeling rather unwell, and usually it’s to do with my food choices. You soon learn what works for your tummy and avoid the things that upset you. My top tip is to keep a food diary from early on, or if you keep a daily diary anyway then make a note of what you’ve eaten. Then if you’re not well you can put it down to that and avoid that for a week or two and then try it again. I have been eating a lot of dairy because of how important Calcium in take is, but some days my stomach doesn’t like how much I’m giving it. Carbohydrates are also important but in moderation along with vegetables. Drink as much water as you’re able to, I also have a glass of fruit juice a day, and sometimes add squash or flat lemonade into my daily drinks when I feel fed up of water. You will find out quite quickly that fizzy drinks are not practical in pregnancy and just exasperate certain things that are happening inside you… Do you think it’s rather windy today? Just because you have limitations on what you can eat and drink, it doesn’t mean you can’t have treats in moderation, and it also doesn’t mean you have to stop enjoying your food. Once your morning sickness is getting better you may find your appetite returns and for me, it even got better! I have had to stop myself reaching for more foods some days. Another Top Tip of mine is to use an app for your phone, I use my FitBit App because you can add into it your Drink and Food daily. It will calculate a rough estimate on how many calories you’re in-taking with your food. I find it very very useful for keeping track of everything! 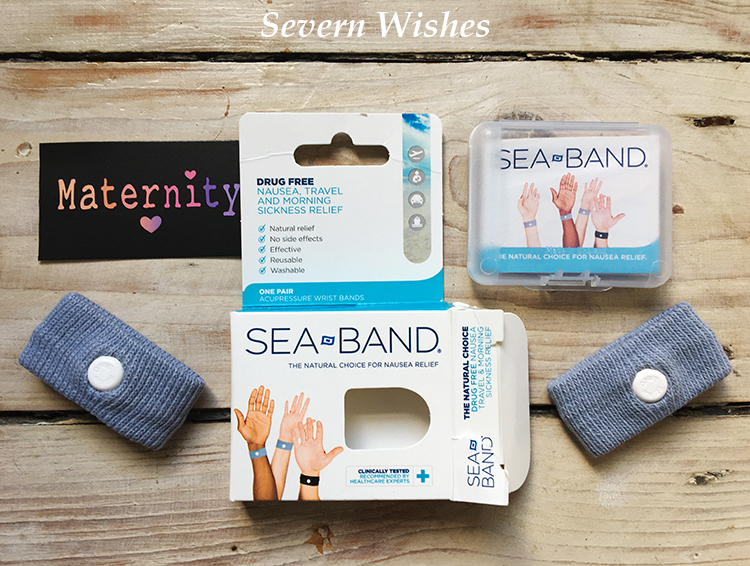 I bought my Sea Bands from Amazon, but you can buy them at your larger local Supermarket Pharmacy Counters too. They come in a few sizes and colours which is nice and you can even put them in the washing machine – very handy if you end up wearing them frequently. I hope that you’ve either learnt something today or just enjoyed reading about the ups and downs of the start of my pregnancy. If you have any questions I’m happy to try and answer them, if you do then please leave me a comment. And remember that the UK NHS website has loads of advice for expectant parents, and your midwife or GP are the best people to talk to if you have any pregnancy related questions, problems or illnesses.If you would like to read more about my pregnancy journey, including recipes and reviews on maternity wear, then you can read the whole category by clicking here for my Pregnancy only category. Thanks for reading today’s post, have a lovely day. This entry was posted in Food & Drink, Health, Lifestyle, Pregnancy, Sabrina's Top Tips by Sabrina. Bookmark the permalink.